I've decided to do readings, using my unique approach to tarot. Because my approach is unique, I would prefer to not use a Rider/Waite/Smith deck or any of its clones. I would prefer to use one of my decks. If you live in my area (currently Chicago), or are visiting, I will meet you somewhere and do a reading in person. If you are not in my area I will do a reading for you by email. If you would like me to do a reading for you, here are the options. (see decks here, or here or the links below). 10s, Jacks, Jokers and title cards and shuffle yourself. I personally think that results are better when someone actually holds the cards and shuffles for them self. I will expect payment within 24 hours after the reading. 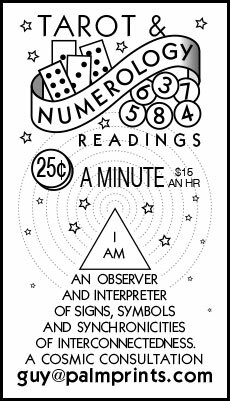 I will trust you to pay me after the reading. If you don't, I put you on a list of people who cannot be trusted. Bad karma. You don't want that. Before we start; a disclaimer: You should be aware of the fact that I am not a psychic, at least I don't consider myself one, although... who knows, I might have some skills in that area. I leave it up to you to decide what to call me. I am also not a fortuneteller, but a reading can at times predict strong probabilities based on how likely someone is to change or not change their life path. I am not a psychiatrist or psychotherapist, although I will at times offer advice that is hopefully helpful. I am not a confessional, but I will listen anyway. I am also not a lie detector for you to use as evidence against people in your life. And I am not here to cast spells or curses on anyone. I am strictly an observer and interpreter of signs, symbols and synchronicities of interconnectedness. I deal in possibilities and probabilities - not certainties. Seeking certainty is a bad idea. I only read what your interconnected self knows and reveals about your life's path, through the medium of a deck of cards. The cards give your interconnected self a voice into this world, where you might otherwise not be able to hear when it speaks to you. So I am not here to tell you what's what. My only purpose is to help you see and understand what your interconnected self wants you to know - a cosmic consultation. Officially, and legally, this is for entertainment purposes only. Advice might be offered, but should always be taken with a healthy amount of skepticism, caution and the awareness that you can change the course of any revealed path on your own. Your fate is not written in stone. Nothing is certain, that's for sure. As for the actual readings, I can type as fast as I talk, so email readings are not necessarily longer in time. But they might be, because of the ability to edit and rethink. However, the advantage of an email reading is the written documentation of our exchange, which you can save, as well as the deeper thought that goes into them, and how you are not charged for the time it takes for you to speak to me via email as different from a live conversation where your input to the conversation takes up time. Of course, if you ramble on in your email, I have to take time to read that. But if you are succinct and to the point it can actually save time and come out cheaper. As a method of reading, I believe that content + context = meaning. So to achieve a good reading, context is important. I can attempt to extract meaning from unknown context by reading in broad general terms. Or, you can explain the context of a situation and craft an approproate question about that situation. The less I know of the context, the longer it takes to zero in on what is being revealed about that context. If you want to test my abilities to know anything by telling me nothing, we can start there and work at it. If you want to know what is being revealed sooner, you can provide some context. In framing a question, always avoid questions that boil down to a yes or no response. If you can't think of a question just ask what your situation is at this time and we will begin with broad generatilies, until we determine what the reading is pointing to. You can elect to participate in a conversation where I ask clarifying question about the context that is apparent, or you can just pose a question and get a single response with no followups. If you have done readings before and are familiar with how they work, you are welcome to choose what type of spread you would like me to use. I will use one of the three spreads described here on my web site. One uses 9 cards. One uses 6 cards. One uses 3 cards. However, be aware that more cards means more time. In addition to doing readings with cards, I will also do Name Numerology readings, using my unique method of calculating influence from a name. If you would like me to do a Name Numerology reading, go visit the Name Numerology Calculator and the Personality Type Indicator and read the instructions. I can do your name only, or I can do the names of other people in your life to see where harmony or conflicts arrise. Name Numerology readings can help with relationships that are in trouble, or relationships that have not yet formed. Find out what kind of person you are actually attracted to and why. Find out why someone who annoys you annoys you. But Wait... There's Even More!! In addition to a card reading and/or a name reading, I will also help you in utilizing my Dream Analysis Calculator with a Quintagram reading. The Dream Analysis Calculator uses Quintagrams and one of my decks to zero in on the meaning of just about anything, including dreams or parts of dreams. If you would like me to use Quintagrams for something other than a dream, we can. In that way, creating a Quintagram is like creating an I Ching Hexagram, which makes it like a one card reading. If you would like a reading using Quintagrams go visit the Binary Influence Calculator and read the instructions. But Wait... There's Even More Than That!!! In addition to a card reading and/or a name numerology reading and/or a quintagram reading, I will also help you interpret any of the do-it-yourself devices I have created and placed on this site. You could use the Fortune Mandala, you could use the Tarot Dice that I've made, you could use the Magic Tarot Ball or the Magic 80 Ball that I created. Assembly required. That's it for now... until I learn about other difficulties of doing this. Let's give it a try. You can email me at guy@palmprints.com. Be sure to put "Request for a Reading" in the subject line or I might accidentally move it to spam! Also... if I get good at this, the price will go up, so try it out now. Give me some practice.